Read the text below and find: a) eight advantages of using visual aids b) three warnings about using visual aids c) three tips on how to use visual aids for effective presentation. Using visual aids can greatly enhance a presentation or speech, but when used incorrectly, can also detract from the message and sidetrack your audience. If using visual aids in a presentation make sure you do so properly, so that they further bring home a point, rather than confuse it. The great danger in using visual aids is that presenters place the major emphasis on visual aids and relegate themselves to the minor role of narrator. 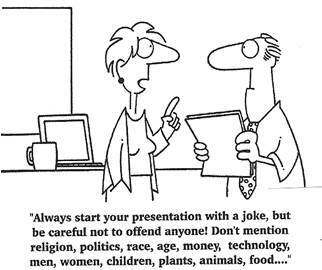 You are central to the presentation. The visual aid needs you, your interpretation, your explanation, your conviction. Visual aids can make information more memorable and they help the speaker. However they must literally support what the speaker says and not simply replace the spoken information. It is also not enough to just read text from a visual aid. There are many advantages to the correct use of visual aids. They can show information which is not easily expressed in words or they can highlight information. They cause the audience to employ another sense to receive information; they bring variety and therefore increase the audience attention. They save time and they clarify complex information. When using visual aids, don't be tempted to rest your entire presentation upon them. In a digital age, where an entire presentation can be made with one computer program, you might wonder about having all the text for your presentation on the visual aids. However, putting too much of your presentation on visual aids can cloud the visual aid's meaning and be confusing to your audience. Remember, why type it out if you can say it? Reserve visual aids for graphs, anecdotal evidence or small quotations, but avoid using it to write out long pieces of text or as the anchor for your presentation. It might be easier to just load your presentation with visual aids that are all the same, graphs and charts, graphics or photos, but it can get boring for your audience to constantly be looking at the same type of visual aid. Watching the same charts and graphs cycle through can be less than engaging for your audience. Change things up by using different visual aids to demonstrate different points to your audience. Try using a mixture of photos, charts, cartoons and even objects that the audience can look at as you speak. Once you've decided on the number and type of visual aids to use, it's time to practice your presentation with them. 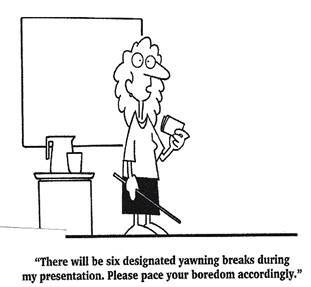 There's nothing worse than a disorganized presenter who has to stop her presentation because of incorrect visual aids or a lag time in the program. Practice how you'll present the visual aids and the transitions you'll use. Practice using the different technologies for your visual aids, be it slides, a computer or an overhead projector. You should feel confident as you go through your presentation, with supportive visual aids that enhance your speech. All the expressions below can be used to comment on a visual in a presentation. Complete them using the verbs in the box. 1. Verbs of change 2. Prepositions 3. Different tenses Profits are falling. Unemployment is rising in many areas. Our business grew by 10% last year. Sales grew to $5.8 million. In recent months our profits have risen dramatically. In January we were making a loss. We’ve been going through a difficult period. a) What kind of movement do the verbs below describe? Match them to the symbols. Use some symbols more than once. b) Which of the above verbs are noun forms? What are they? For example, to increase – an increase. c) Complete these sentences about the graphs with appropriate prepositions. 1. Sales have increased ..........£5m..........£7m. 2. Sales have increased ..........£2m. 3. There has been an increase ..........£2m in our sales. 4. Sales now stand ..........£7million. 5. Sales reached a peak ..........£7 million in July. 6. Sales reached a low points ..........£1million in April. Complete the conversation with appropriate forms of the verbs in brackets. Sometimes more than one tense is possible. Peter John Peter Kate Peter Kate I’m glad you managed to make it today. I’d like to start by taking a look at the year’s sales and profit figures. First of all, John, could you summarise the sales figures? Well, we had a good January – 5.2 million. January’s a difficult month because sales always ..........1..........(drop) after Christmas. In February we launched the new Chilren’s line and it went very well. Total sales ..........2..........(rise) to almost 8 million, which was nice. Unfortuntely they then ..........3..........(plummet) after the fire in the main factory. But by the end of April we ..........4..........(recover) – 10.2 million was the figure – and since then sales ..........5..........(go up) steadily month by month. The December figures aren’t in yet, but it looks like we ..........6..........(probably reach) 15 million this month. Good. I’ve got a couple of questions, but I’ll save them for later. Kate, sales have increased, but has that meant higher profits? Yes, it has. We are waiting for the final figures, but we already know that overall in the first three quarters of the year, profits ..........7..........(rise) by 15% compared to last year, from 960,000 to 1.1 million. In fact since April, profits ..........8..........(increase) every single month and they ..........9..........(still go up). What about next year? Well, as you know, next year we are going to centralize distribution, so costs ..........10..........(decrease). Even if sales ..........11..........(level off), profits ............12..........(improve). Holding the audience’s attention Pre-reading · The students don’t seem to be interested, do they? Why? · Can you give the reasons? · How can the speaker keep the audience attention? 1. Read the following passage and identify at least six recommendations about speaking technique which can help to make the message in a presentation clear. 2. Discuss these recommendations with your partner. 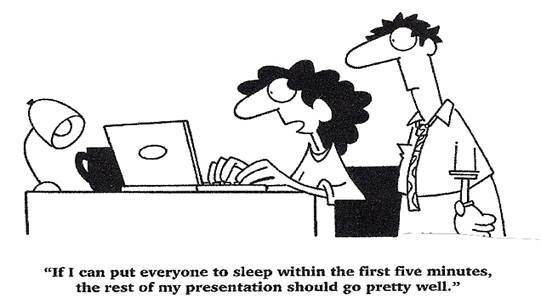 Clear objectives, clear plan, clear signals: the secrets of presentation success. 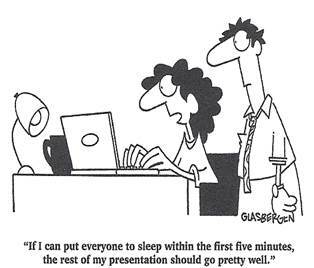 Any presentation requires a clear strategy or plan to help you reach your objectives. The aim is not to pass away twenty minutes talking non-stop and showing a lot of nice pictures. It is to convey a message that is worth hearing to an audience who want to hear it. However, how many speakers really hold an audience’s attention? What is the secret for those who do? First, find out about the audience and what they need to know. Plan what you are going to say and say it clearly and concisely. A good speaker uses various signals to help hold the audience’s attention and make the information clear. One type of signal is to introduce a list with a phrase like There are three things we have to consider. The speaker then says what the three things are and talks about each one at the required level of detail. For example: There are three types of price that we have to think about: economic price, market price and psychological price. Let’s look at each of these in more detail. First, economic price. This is based on the production costs and the need to make a profit …and the speaker goes on to describe this type of price. After that, he goes on to talk about the market price and so on. Another signaling technique is to give a link between parts of the presentation. Say where one part of the talk finishes and another starts. For example, a well organized presentation usually contains different parts and progression from one part to the next must be clear, with phrases like That’s all I want to say about the development of the product. Now let’s turn to the actual marketing plan. This technique is very helpful to the audience, including those who are mainly interested in one part only. background, the present situation and the future. Key words in sequencing information are first, then, next, after that, later, at the end, finally, etc. Still another technique which helps to emphasize key points is careful repetition. Examples are As I’ve already said, there is no alternative but to increase production by 100% or I’d like to emphasize the main benefit of the new design – it achieves twice as much power with half as much fuel. A final point concerns timing and quantity of information. Psychologists have suggested that concentration is reduced after about twenty minutes without a break or a change in activity. Furthermore, audience should not be overburdened with technical details or given too many facts to remember. It is claimed that to ask people to remember more than three things in a five minute talk is too much. Some say the seven is the maximum number of any length of presentation. Any such calculations are probably not very reliable, but every speaker needs to think about exactly how much information of a particular type a specific audience is likely to absorb and to plan accordingly. 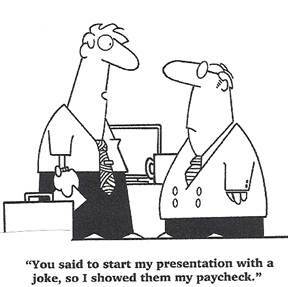 Work with a partner to give a team presentation. Step One: Brainstorm Your job is to come up with an innovative idea for a product or service that could be developed by your company. Step Two: Plan Make sure the new product or service:’ · Is a new departure for your company · Meet a need not catered at present Step Three: Rehearse Use the presenters’ prompt cards below to help you structure your talk. Create any visuals you need. Step Four: Deliver Give the presentation. Invite questions at the end. ü identify the main points. ü write down 10 questions. ü make the vocabulary card (new words, expressions, idioms, etc). ü prepare and make one-minute presentation on the issue discussed in the article. Some say the secret of being a good presenter is to visualize the audience naked. I say if you really want to be a great speaker, it’s the speaker who must strip for the audience. Great speakers and presenters are not afraid to bare their souls to the audiences. They strip away their masks and illusions allowing audiences and prospects to see them for who they are. Within four seconds, most of us form an immediate impression and then spend the next 30 minutes justifying our impression. Think back to a blind date, first interview, or social situation. Did you make a snap judgment as to whether or not you were going to like him or her? Most of us do. We do it to others, and others do it to us. Most audiences decide whether or not they like us before we utter our first word. Six factors contribute to first impressions: gestures, movement, dress and grooming, stance, and eye contact. Of these, dress and grooming, stance, and eye contact are most important. Experts abound on the subject of proper dress and grooming for presentations, yet the best advice I found came from one of my seminar participants. She suggested looking into the mirror and noticing if anything stood out, and if it does, taking it off and changing it. One man I coached loved loud ties. While his neckwear reflected his outgoing personality, it also distracted from his presentation. The audience focused on his ties rather than his face, missing much of what he had to say. Like appearance, stance contributes to instant credibility, and for many women, stance is a challenge. Most women are taught at a young age to assume a dancer’s pose, feet close together with one toe pointed out at a 90-degree angle. While this stance may be feminine and pretty, it holds no authority. Instead, I counsel both men and women, to stand tall, feet shoulder width and pointed outward, hands at their sides. While it is important to gesture naturally, hands should drop to the sides when not in use. Stance is important in establishing credibility so don’t hide it. At no time should speakers stand behind a podium, desk, table, or other obstacle. Great speakers allow the audiences to see all of them – physically as well as emotionally. The eyes have been called the “windows of the soul.” As such, they are one of our greatest weapons in winning audiences. When it comes to eye contact, great speakers use a rifle instead of a shotgun. I coach executives to begin their presentations by standing in silence, finding a friendly face, establishing eye contact, taking a deep breath, and then beginning their talk. This simple tip helps speakers become grounded and start their presentations with authority. Many presenters talk while moving their heads from person to person like a sprinkler system, or worse they lose all connection with their audience by staring at one person, the slide screen, or into space. I train presenters to pick one person and maintain steady eye contact with that person until they have delivered a complete thought. Intensive eye contact can be uncomfortable, yet it is also highly effective in generating trust. Discomfort is a constant companion for great presenters for they know no matter how good they think they are they can always be better. Using appearance, stance, and eye contact, they generate instant credibility while constantly challenging themselves to share more of themselves with their audiences.